2019 Mazda CX-5 Lease. Bad deal? Hello, this is my first time leasing and I am looking for a Mazda CX-5 Touring in NY. I am getting quoted an offer for $400 / mo with $1,500 down. When I run the numbers on the leasehackr calculator, it seems like the only way to get those payments is with 0% discount and no lease cash. However the dealer claims they’ve discounted heavily and counted the lease cash. Am I doing something wrong or is this really a bad offer? However the dealer claims they’ve discounted heavily and counted the lease cash. They SAID they discounted heavily…did you actually SEE that they did? Get some numbers. Mazda’s typically aren’t good leases, but a mid tier CX5 shouldn’t be 400/mo w/1500 down. You could probably get into a GT for less than that. It’s about the details…they have them, you need them. MSRP, Selling price, dealer discount, incentives/rebates, fees, tax…no one can help you evaluate a lease in a comprehensive way unless you have this level of detail. That makes sense, thanks. I’ve tried to ask for the numbers but the sales rep is a bit cagey about it. It’s taken a few days just to get MF/Residual and MSRP. He won’t share cap cost and fees so far though. It helps to know if it’s in the ballpark of a good/bad deal to calibrate how aggressively I can push back. To get the best deal, you need to be emailing every dealer within 100 miles. The MF, residuals, and incentives can be found here ( https://forums.edmunds.com/ ) by selecting the appropriate Make, Model, and forum thread. Take a look at a CX-5 that you find suitable on cargurus.com and look at the Price Analysis. You can do better than the “Great” number if you do your homework or get lucky. On an MSRP of $29,360, looks like a “Great” price according to cargurus is $27,071 or 7.8% off MSRP. The Residual can’t be marked up, but the MF can, so you need to confirm it on edmunds and then you can start to figure out what a reasonable monthly would be using the lease calculator to get a decent approximation. I meant the Residual can’t be marked up, but the MF can! Original post now corrected. Thanks. Hadn’t discovered cargurus.com website, it’s great thanks! Using those numbers and MF/Residual from Edmunds, I’m coming up with $316 mo. I can see fees taking that higher but not to $400 which still looks like a bad deal. A few thoughts about your calculator link. Don’t put $1,500 down - if you total the car, that money is gone. Verify the dealer/doc fee - it may be more than the $80 that’s in there. Verify the proper Government title/plate fees - they are unlikely to be $400 on the dot. You should be able to do better than 5% off MSRP…email a bunch of dealers. After you get a few offers, post the details in this thread before signing. You will not believe how many people sign horrible lease deals and then come to this forum to ask how they did…don’t be one of those people. You will not believe how many people sign horrible lease deals and then come to this forum to ask how they did…don’t be one of those people. I was almost one of those people! It was very hard to say no to the deal at the dealership. Thanks for the help here. May I ask who gave you the 60% residual number? That seems really high for a CX-5. I was thinking it would be closer to 51%. If they put 60% in writing, that’s good for you! 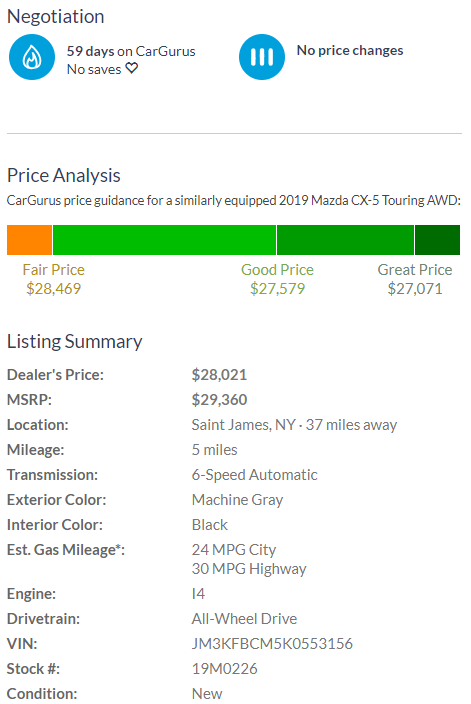 Based on info here: https://forums.edmunds.com/discussion/53344/mazda/cx-5/2019-mazda-cx-5-lease-deals-and-prices/p31, the 60% 36/15k residual looks correct as does the MF. If they put the wrong residual in put in a contract, the captive that is financing the deal will reject it, so it’s not really a plus…it means that you will have to fix the paperwork and try to get the dealer to eat the difference or return the vehicle and hack another lease altogether - major headache. So I worked with a couple dealerships and best deal I’ve been able to work out is $335/mo with $0 down and about $2,800 drive-off. This is so much better than the original $400/mo with $1,500 down; thanks for the help all. It’s about a $30/mo savings, but you’re still putting a significant amount of money out of pocket that could potentially be lost should the vehicle be stolen or totaled. How many dealerships have you gotten quotes from? I am also shopping this car in the Philly area - I walked into a dealership and no questions asked was given $415/mo $0 down as my initial offer on GT w/ Premium Package. Edit: I’m headed to a new dealership to see what they do tomorrow, I’ll keep you posted. Mostly depends on the wife liking the car tbh. So I’m struggling to get the out-of-pocket lower. It’s $1,000 tax, $335 1st month payment, $350 in govt fees and $499 doc fee. That’s about $2,200. I’m on my 3rd dealership now. This would be the same no matter the dealership I go with? The other $600 are dealer markups. I assume if I keep trying I can eliminate these but it’s costing me $$ every day since I don’t currently have a car and paying uber/public transport. This would be the same no matter the dealership I go with? You should be able to structure the deal however you want. You can tell them to roll the fees in to your monthly payment. I think 3 dealerships is probably on the lower end if I’m being honest. You’ll want to cast a wider net in order to nail down the best deal possible, although if you are having to Uber, etc., you may have to settle. 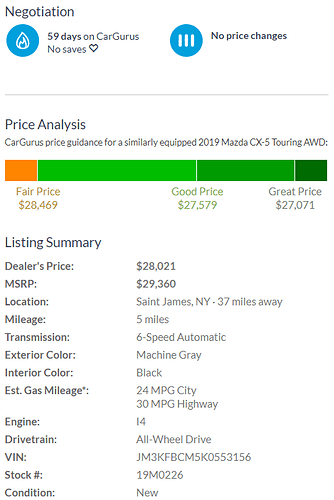 Mazda doesn’t tend to discount as much as their spread between invoice and MSRP is not that big, but that’s really the only area left to negotiate here.